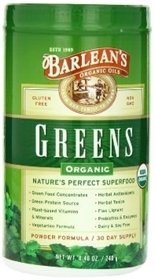 New and improved at 95% organic, gluten free and non-GMO, Barlean's Greens are a great-tasting, premium superfood, masterfully formulated with Nature's most vitalizing plant-based ingredients. Every whole food ingredient is responsibly grown and third-party tested to guarantee the absolute highest quality and purity. Wheat grass powder contain high concentrations of valuable nutrients, including chlorophyll, vitamins, minerals and natural enzymes. These juice powders are 100% pure, CO2 cold temperature dried and contain no insoluble fibers, carriers or additives. This high purity makes them more soluble in water and ideal for use in a variety of drink mixes. Wheat Grass literally floods the body with therapeutic dosages of vitamins, minerals, antioxidants, enzymes, and phytonutrients, and is also a powerful detoxifier, especially of the liver and blood. It neutralizes toxins and environmental pollutants in the body, due to beneficial enzymes that help protect us from carcinogens. Superoxide Disumates (SOD), that lessens the effects of radiation and digest toxins in the body and cleanses the body from head to toe of any heavy metals, pollutants and other toxins that may be stored in the body's tissues and organs. Chlorella is a green single-celled micro algae that contains the highest concentrations of chlorophyll known (60mg/serving). Chlorella supplies high levels of Beta-Carotene, Vitamin B-12, Iron, RNA, DNA and Protein. When chlorella is taken into your body, its natural action will bind it to lingering heavy metals, chemicals and pesticides found in your digestive tract, which is your body's pathway to your bloodstream where these harmful toxins are delivered and deposited into your body's cells. So chlorella first and foremost will help your body eliminate unwanted metals and toxins. It may also help reduce both cholesterol and hypertension. Chlorella's cleansing action on your bowel and other elimination channels, as well as its protection of your liver, also helps promote clean blood. And clean blood helps assure metabolic waste get efficiently carried away from your tissues. Spirulina contains the highest protein and beta-carotene levels of all green superfoods, and is also a rich source of GLA (Gamma Linolenic Acid), a popular fatty acid with numerouse health benefits. In addition, it is the highest known vegetable source of B-12 and provides optimum levels of vitamins, minerals, trace elements, cell salts, amino acids and enzymes. For vegetarians, spirulina is 65-70 percent complete protein, and is the highest source of B-12 as well. Spirulina is green in nature, and hence it contains a significant amount of phycocyanin and chlorophyll, the latter absorbs energy from the sun to manufacture carbohtdrates which boosts your energy. Spirulina is a powerful antioxidant, and due to it's highly nutitious profile, many people that consume it are able to lose weight. One of the most vital spirulina benefits, which were proven by research, is that it can aid in fighting cancer and any viral illnesses. It is also been shown to enhance a person’s immune system, and help in increasing the libido level of individuals. Another benefit of spirulina, similar to green tea, it is also one of the most natural anti-aging products that can be found. Spirulina also has the capability to strengthen your teeth and your bones as well as improve you eyesight. Barlean's is committed to providing a range of dietary supplements that meet or exceed their customer’s expectations and they have a history of building long-term partnerships with their customers and suppliers. It is their philosophy to continuously improve and innovate in all aspects of their company organization. To that end, their quality systems, standards, and procedures are constantly being reviewed to ensure that they extend beyond commonly accepted boundaries of excellence. Thus they are committed to satisfying and/or surpassing the requirements of customers, consumers, and relevant national and international legislation on Quality and food safety.